Click on the Tools menu and choose "Options". Make sure that the "General" tab is selected in the Options dialog that opened. Note: these settings affect every email accounts setup in Windows Mail; the end of this tutorial covers individual email accounts. The "Send and receive messages at startup" checkbox, checked by default, tells Windows Mail if it should connect to the server when it starts. If you uncheck it, the next check will happen [x] minutes after the program has started. If "Check fore new messages every [x] minute(s)" checkbox is checked (it is by default), Windows Mail will automatically query the server for new mail at the selected interval; if it is unchecked, the program will only check for new emails when you click the "Send/Receive" button (or press the equivalent Ctrl+M keyboard shortcut). The dropdown menu controls behavior when no internet connection is available: • "Do not connect" (default) - nothing will happen, and the application will wait until a connection is restored; you may receive error messages every [x] minutes. • "Connect only when working offline" - will check for new mail only if you are not offline; you are never online unless you manually switched (see next section). 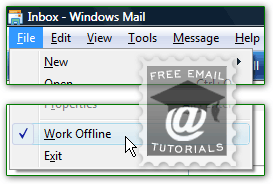 • "Connect even when working offline" - this setting allows you to keep using Windows Mail normally, even if Internet Explorer is working offline (otherwise, checking for messages will put both back online, as loading a web page will - see last part of this tutorial). Click on the OK button to accept the new settings and return to Windows Mail. Remember that you can always manually check for new emails, regardless of whether the number of minutes to wait before new mail checks has elapsed or not - the dropdown arrow lets you pick which account to check, receive mail only, or send mail only. You ultimately have full control! Uncheck the "Include this account when receiving mail or synchronizing" checkbox, and click on OK. Repeat these steps for every email account you want to exclude. Caveat: because Windows Mail and Internet Explorer are tightly integrated into Windows Vista, either one will know when you go offline with the other one. Browsing the web in IE will require that you go online, which will set Windows Mail to "online". If Vista uses desktop gadgets that require an internet connection (like the weather gadget), it will show a " Service not available " error message while you are offline, if the gadget tried to connect while Windows Mail was offline.